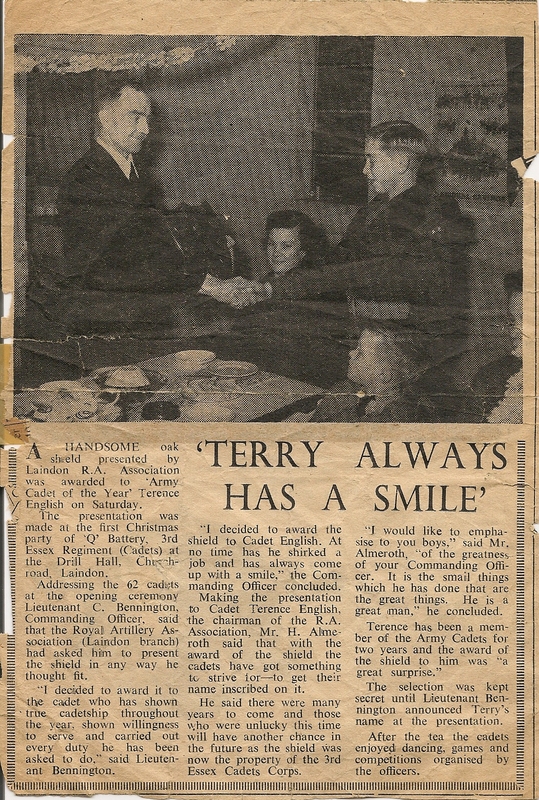 This is the plaque and newspaper cutting (below) from 1953 when my husband Terry English was awarded Army Cadet of the Year. A HANDSOME oak shield presented by Laindon R.A. Association was awarded to ‘Army Cadet of the Year’ Terence English on Saturday. The presentation was made at the first Christmas party of ‘Q’ Battery, 3rd Essex Regiment (Cadets) at the Drill Hall, Church Road, Laindon. Addressing the 62 cadets at the opening ceremony Lieutenant C. Bennington Commanding Officer, said that the Royal Artillery Association (Laindon branch) had asked him to present the shield in any way he thought fit. “I decided to award it to the cadet who has shown true leadership throughout the year, shown willingness to serve and carried out every duty he has been asked to do.” said Lieutenant Bennington. “I decided to award the shield to Cadet English. At no time has he shirked a job and has always come up with a smile,” the Commanding Officer concluded. Making the presentation to Cadet Terence English, the chairman of the R.A. Association, Mr. H. Almeroth said that with the award of the shield the cadets have got something to strive for – to get their name inscribed on it. 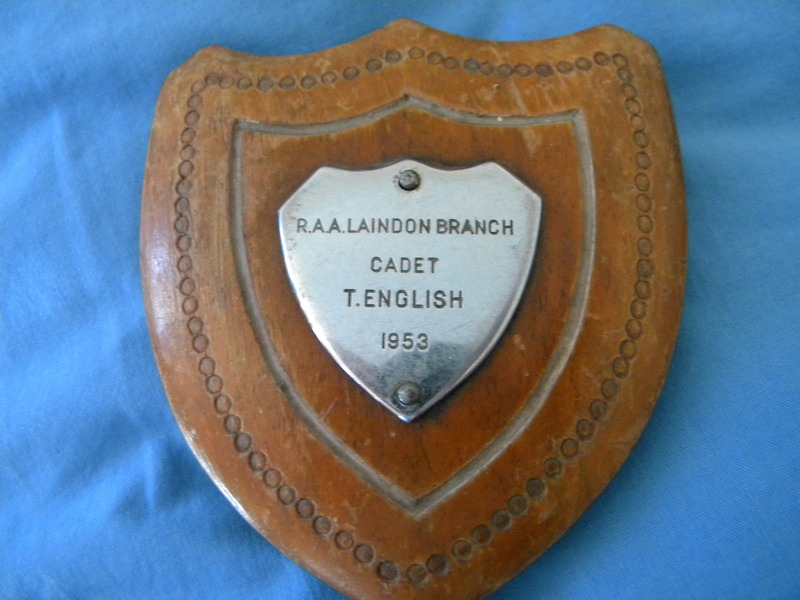 He said there were many years to come and those who were unlucky this time will have another chance in the future as the shield was now the property of the 3rd Essex Cadets Corps. “I would like to emphasise to you boys,” said Mr. Almeroth, “of the greatness of your Commanding Officer. It is the small things which he has done that are the great things. He is as great man,” he concluded. 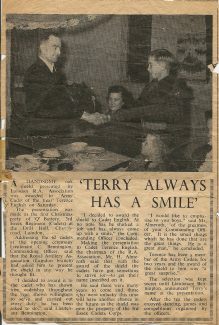 Terence has been a member of the Army Cadets for two years and the award of the shield to him was a great surprise.” The selection was kept secret until Lieutenant Bennington announced Terry’s name at the presentation. After the tea the cadets enjoyed dancing, games and competitions organised by the officers. My mother-in-law saved them over the years and Terry would have loved to follow it up by joining the Army but unfortunately he is completely deaf in his left ear and was therefore unable to. Hi Keith, Terry and his family lived at no 9 Royston, you are younger than all three brothers, Terry born 1939, Robert 1943, Mark 1958. Robert was dark haired and Terry and Mark had the same colouring. Hi, I remember the Drill Hall before the new road went through to Billericay. Was Terry living in Royston Avenue? I remember Mr English, Mark and Terry. I lived in Royston for 31 years, regards. Hi Keith, Yes, Terry did live in Royston Ave, his parents moved in on their wedding day in Aug 1937 and both lived there for 55 years till his dad died and then his mother 6 years after, they were exceptionally lucky to spend all their married life in the same bungalow and raise their three boys, Terry, Robert and Mark. Which one are you closest to in age? Hi Ellen, I remember Terry, his dad and Mark don’t remember Robert though. I was born in 1950 and lived in no 10 Royston. Thats a long time to live in one bungalow. I can still picture Terry’s dad walking down the road. The reference to a Mr Almeroth rings a bell. Not a common name. There were two Almeroth girls (must be the daughters) who lived across the field behind Sizer the butcher. I cannot remember the name of the street but it paralled the High Road and ran into Nicholas Lane across from Douglas Road. The street name began with a T I believe. The older Almeroth girl, Audrey, attended Ursuline in Brentwood with Gill Toomey. We were sometimes on the same bus from Billericay. They from Brentwood and me from Chelmsford.